There are 4 dogs living on the ranch at the moment. Louvik, Shotzi, Alex and Yellow. 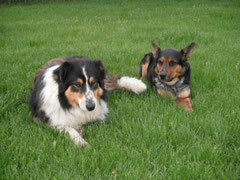 - Louvic is an adult Australian shepherd mix, who circles around the herd or brings the cow back to the herd. He appears rather lazy in the summer, but if you had that heavy coat to carry around when it's warm, you'd hide in the shade too! Shotzi is a driving dog, she drives the herd from behind to the designated area or guards the gate. Alex is their son who belongs to the Grandgirls but they rarely have a property large enough to properly exercise a dog of this sort. I think Alex would also like to be a circle dog but he has not had the training his dad received. All these dogs love to work and always join us when we go out, because we might be going to chase cows. Yellow on the other hand is a bit of a conundrum. 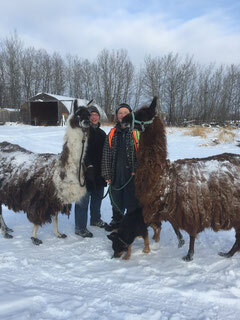 He adopted the McLeans when they were living in Prince Albert but he is a traveler and that is not acceptable in a rural community, so he must remain penned or chained up. Yellow is Chris' dog because he loves to go out hunting and will retrieve birds for Chris. Yellow also loves to go in the water and get thoroughly wet, well, as wet as retrievers get. He's a hound so he shows no interest in cows unless they charge at him. Alex is a faithful type of dog who is well mannered and has been taught his basic obedience. He will remain where he is told to "sit" and "stay" unless there is a cow about to run him down or he thinks that Louvic needs help. Shotzi finds the snow and cold weather difficult. Louvic on the other hand loves to lie down and roll in the snow. Yellow has to be taken on walks and loves to investigate. The chickens who lived at Winning Ways have unfortunately been stolen and in some cases badly maimed by a marauding fox. Several of us saw the fox and although the hens tried to stay close to the barn their numbers dwindled until we took the last two to Meeds Meadows. 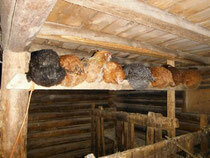 Perhaps we can start with chicks next spring. There are a pair of Indian Runner ducks who live in a pen in the summer and this winter, because the chickens are no longer with us, the ducks get to use the 'chicken house'. 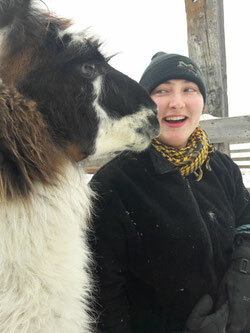 The llamas are pets and have lived on the ranch for many years. Originally they stayed with the cows but some of the old cows with horns objected to them so now they live around the yard. 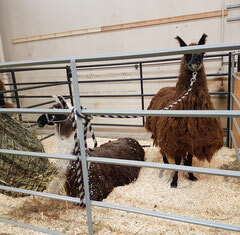 They get used for lessons to teach children how to handle and lead a llama. Haley has traveled to many different places when Winning Ways has held Petting Zoos. If she is not sure she wants to be led she will go 'cush' (sit down) and then we have to pick her up to get her to move! Haley and Whiskers out for a walk. 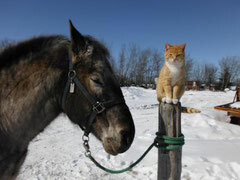 Haley in cush postion; Whiskers is on-guard at the Petting Zoo. There are two ewes at Winning Ways and we hope that since they have been to visit the ram they will be mommas in the spring. Krafty (light colored) is the older ewe and has had a lamb before. 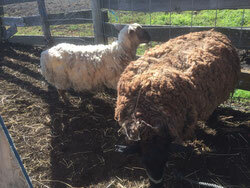 Shelia (brown/black) is a couple of years old and will have her first lamb in 2018. One of the classic WW photos with Joker, Annie and Sumo sunning themselves. 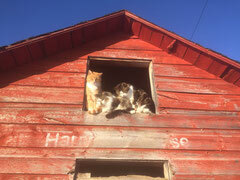 The wood-shed cats Brooke & Tubby moved into the porch for the winter. They stay in their corner and try to be unobserved in case someone might 'throw them out'. The ranch has 5 barn cats of different ages and colors who live outside all year long and keep the yard mouse-free and clean up table scraps. There are also 2 'wood shed' cats that live here temporarily until the Grandgirls and their parents find a property where they can have their animals all back. Two cats are allowed in the house, they are both black and white and we call them Hobo and Gwen. Hobo is a wise and old cat, who has a great deal to "say" but is totally deaf (you can run the vacuum right past him and he does not even wake up!). 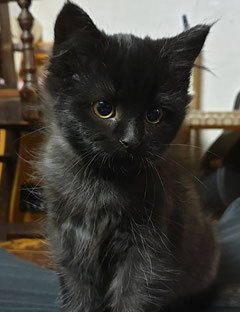 Gwen is younger and very cuddly, but occasionally mischievous or perhaps just more 'cat-like'. 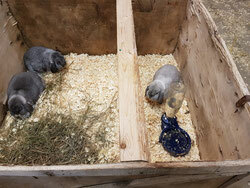 There are three bunnies who live in either their winter hutch or their summer pen. In the photo they were at a petting zoo where folks could touch them and pick them up. Info for Spring Camp and Spring Lessons has been posted. Look under Horse Activities. Kelly's Adventures continue to appear on another Blog Page. Lots of pictures to go with the stories.